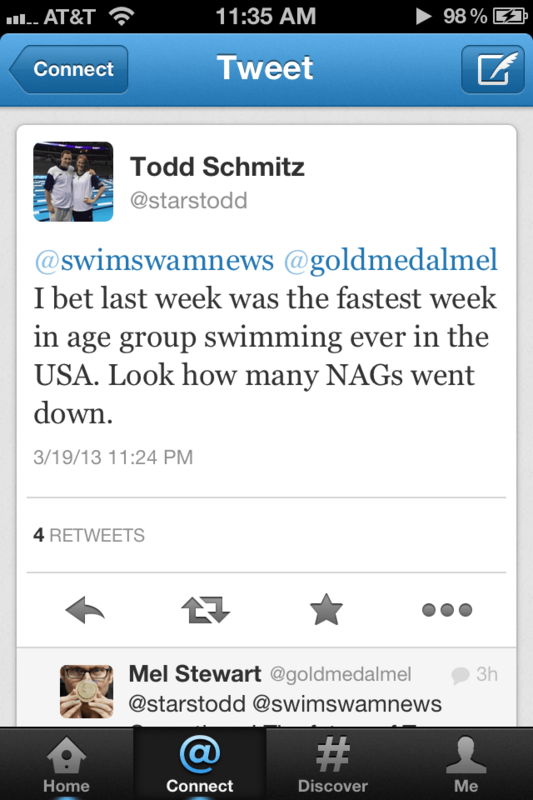 When Todd Schmitz, head coach of the Colorado Stars and Missy Franklin, tweeted at us this morning that he thought last week (with NCSA Junior Nationals, the Federal Way Sectional, Sectional meets in Florida and Knoxville) was the fastest week in age group swimming ever in the USA. He guessed it was almost 20. We haven’t had time to crunch the numbers on when the most rapid rewrites of the National Age Group Record books have been, but this month will surely rank among the best. In fact, though, Schmitz underestimated the number. In the week from March 12th to March 19th, by our count, there were 23 National Age Group Records, with an additional 4 coming the week before, for a grand total of 27 (thus far recognized by USA Swimming) going down in just the 20 days of March so far. Yes, that means on average, we’ve had more than one National Age Group Record per day: validating the fatigue our fingers have felt here at SwimSwam on writing them all up. In total this short course season, we count 78 records. Only 196 yards NAG Records even exist. And we’re probably not done yet either. Tennessee freshman Faith Johnson could break the 17-18 50 free record at NCAA’s. Neither she nor Georgia’s Annie Zhu (200 breaststroke) turn 19 until the fall. (Note: Johnson’s Birthday is October 6th, Zhu’s September 1st, if you wish to congratulate them when the time comes. Chase Kalisz broke the 400 IM record at SEC’s, but turned 19 on March 7th, so his run is over). California has yet to hold their high school State Championship meet, and there’s always a few unbelievable 14-year old freshmen that show up there, plus the runs at the older age groups. It’s been a simply amazing year. To see USA Swimming’s ful list of approved NAG Records this year, click here. I wonder if you were to look at the NAG records per year (dating as far back as records exist) if there is any correlation between records being broken and the year after an olympics. My guess is that there would be a jump in records. I would have actually thought it would be the other way, as coaches are aiming to peak at the end of the Quadrennial. Well I was assuming that for most of the age groups they weren’t really worried about making the Olympics. I know in the past 14 year old’s have made it, but I don’t think that will happen any more.. (maybe for a girl… but highly unlikely) but short of that I don’t see anyone younger than 15-16 making it. I also think that as an age grouper you can peak every single year because of how much growing is going on. You really only have to consider the quadrennial peak for people that are old enough and developed enough that they wouldn’t get better just by sheer fact of getting bigger. It is not about being capable or not.. but having the age you thought during OG.. Xu Danlu 13 years didn´t go because of few months.. if OG were this year she would go and be a medal prospect already.. there maybe many other youngster who on 13~15 years is already capable of OG, but they reach this age short after OG..
Let’s not forget the many other short course age group championship meets that will be taking place over the next four weekends…. Braden, your job or reporting age group records is not yet over! And how many since last September and the beginning of the SCY season in USA? It must be huge. It’s the MP generation. These kids have grown up with the king as model and hero.